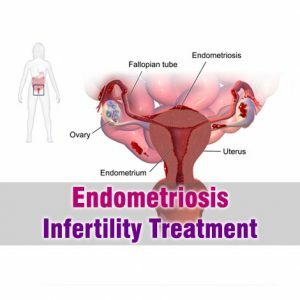 Home > Womens Health > What Are The Endometriosis Infertility Treatment Options? In endometriosis disease the endometrium tissue, which should actually grow inside the uterus grows outside. Extreme endometriosis causes pelvic pain and infertility. Nearly half of the women with endometriosis face the problem of infertility. Pain due to endometriosis varies mild to chronic. Most of this pain is generally experienced during periods. Many things need to taken into consideration for Endometriosis infertility treatment. Such things include the age, location of the endometrium growth, period of infertility, and pain experienced. Chances of getting pregnancy with endometriosis treatment are more in initial stages (I and II) compared to later stages (III and IV). Endometriosis surgery is generally done during the diagnosis process through Laparoscopy. This surgery involves in surgical removal of outside grown endometrium tissue. Endometriosis Surgery shows better results in case of mild endometriosis (Stage I and II). With the help of this surgery, the chances of becoming pregnancy increases when compared to women who do not undergo any treatment. Usage of fertility drugs combines with intrauterine insemination is another effective endometriosis infertility treatment option. Intrauterine insemination involves in depositing of sperm into uterus. And the fertility drugs helps in stimulating ovaries for producing more eggs. This shows more success rates in case of mild to moderate endometriosis. Fertility drugs that are used in this process include gonadotropins, clomiphene citrate, etc. In-virto fertilization procedure involves in combining sperm and eggs removed from ovaries in laboratory. Once the embryo is developed successfully, it is transferred into woman’s uterus. The rate of success for fertility in women with endometriosis is more in case of In-virto fertilization. In case of severe endometriosis (Stage III and IV), where the production of eggs is very less, usage of ovarian hyperstimulation drugs for 3 to 6 months prior to starting In virto fertilization is prescribed.